We are 13 years into a secular bear market in the United States. The Nasdaq is still down 40% from its high, and the Dow and S&P 500 are essentially flat. European and Japanese equities have generally fared worse. The average secular bear market in the US has been about 11 years, with the shortest to date being four years and the longest 20. Are we at the beginning of a new bull market or another seven years of famine? What sorts of returns should we expect over the coming years from US equities? Even if you have no investments in the stock market, this is an important question, in part because the pensions funded by state and local governments are heavily invested in US equities. In fact, they are often projecting returns in excess of 10% per year. How likely is that to happen? Who will make up the difference if it doesn’t? In nearly all states and jurisdictions, it is against the law to change the terms of a public pension plan once it is agreed upon. Even more important to you personally, what will happen to your taxes if the secular bear persists? On this final day of 2012, let’s take a look at the potential returns of the stock market over the next 7-10 years. In previous Thoughts from the Frontline and in my book Bull’s Eye Investing, I have written that stock market returns are a function of valuations (typically, price-to-earnings ratios). Secular bull markets are periods of rising valuations, while secular bear markets are periods of falling valuations. While stock market returns can vary widely over one-year, ten-year, or twenty-year periods, over the long term stock market earnings have tended to correlate very highly with GDP and inflation. Since GDP has tended to grow (at least until recently) at 3% per year, predicting long-term returns and secular bull and bear markets has been pretty straightforward. But recently several noteworthy analysts have presented research suggesting that GDP will not grow anywhere close to 3% over the coming decades. In today’s letter we look at the ramifications of slower GDP growth on equity returns. For most investors this is a very important topic, as the stock market tends to be the main driver of their investment returns. So Who’s the Optimist Now? At the beginning of the last decade I wrote that the US economy would be lucky to grow at 2% for the entire decade. Even though I was called a “big bad bear” at the time, it turns out that I was an optimist. The economy grew at 1.7%. When asked about the present decade a few years ago, I cautiously said that we would be lucky to grow at 2% for the decade, which elicited more bearish name-calling. Now I once again find myself to be more optimistic than some of my colleagues. Adding further to the sentiment, Dr. Robert Gordon, a very respected economist, wrote a paper for the National Bureau of Economic Research provocatively titled Is U.S. Economic Growth Over? Faltering Innovation Confronts the Six Headwinds. Even if Gordon does measure growth somewhat unconventionally, his is a very sobering forecast. Finally, we have a paper called 1%... The New Normal Growth Rate? Authored by Chris Brightman of Research Affiliates (the firm founded by my friend Rob Arnott), it presents their view that 1% is the “new normal” growth rate. Chris follows up on research presented earlier, in which they described what they call the “3-D Hurricane” of deficits, debt, and demography. As noted above, the longer-term assessments for GDP growth are turning decidedly lower than the long-term 3% we saw over the last century. Our purpose in this letter is to look beyond the details of each argument as to the prospects for growth. That is, our objective is to understand the long-term implications of growth for stock market returns. Whether your favorite economist foresees 2%, 1%, or 0% long-term growth, the outcome for returns is similar in direction: the impact will lie somewhere between bad and worse. The following discussion includes excerpts from Ed’s book Probable Outcomes (and it’s one I highly recommend – John). It explores the possibility that future real economic growth may have downshifted from its historical trend of 3% – and more significantly, it highlights the implications of that shift. Historically, the prospect of slower economic growth has not often been considered by economists and analysts, but it now looms large in mainstream thinking. The effects of slower growth on stock market returns will be dramatic for investors. Most investors recognize that the stock market delivers extended periods of above-average and below-average returns. These periods are known as secular stock-market cycles. The last full secular bear was 1966-1981. The most recent secular bull ran from 1982-1999. Our current secular bear market started in 2000, and it still has a long way to go. Figure 1 presents all secular stock market periods since 1900. Figure 1. Secular Stock Market Cycles. These secular periods are not the result of a random walk through good times and bad times. They are not periods of war or peace. They are not even alternating periods of recession and expansion in the economy. Rather, secular stock-market cycles are driven by changes in the overall value of the market. In other words, secular bull markets are periods when the price/earnings ratio (P/E) of the market rises and compounds returns, while secular bear markets are periods when P/E declines and compromises returns. The blue line near the bottom of Figure 1 shows the history of P/E. Rising P/E drives secular bulls (green-bar periods), and declining P/E drives secular bears (red-bar periods). Most important, the P/E cycle is not a coincidental wave nor a random walk. P/E is driven by the trend and level of the inflation rate. Higher inflation drives interest rates upward. Investors demand higher returns to offset the adverse impact of inflation. Thus, higher inflation drives P/E lower, so stock-market investors can achieve higher returns from lower prices and higher dividend yields. Deflation also drives P/E lower. That occurs in response to an expected future of declining nominal earnings and dividends. And declining nominal cash flows during deflation drives current values lower. Therefore, for more than a century, stock-market investors have endured secular stock-market cycles driven by the inflation-rate cycle. But there is a second variable that determines stock-market valuation. Until recently, that variable could be ignored because it was accepted as a constant. Over the decades, this second variable has seemed to crawl along like the notorious tortoise. The second variable impacting stock-market value is the growth rate of earnings. Investors know that high-growth companies have higher P/Es than slower-growing, mature companies. The same principle applies to the market overall. It is especially relevant now that the constant of economic growth is uncertain. During the past century, real economic growth increased at an average of slightly more than 3% annually. As a result of the strong relationship between earnings and the economy, earnings per share (EPS) for the major stock market indexes also increased at near 3% in real terms. P/E generally peaked in the mid-20s (except during the Great Bubble of the late 1990s) and troughed below 10. The outside range for P/E, as well as its midpoint average near 15.5, occurred with such consistency because the growth rates of both the economy and earnings were so consistent over the long term, at close to 3%. In effect, the growth rate determines the P/E range and midpoint, and the inflation rate determines the location and trend within the range. A change in growth rate causes a shift in the range. These two dynamics are illustrated in Figure 2. One effect of slower economic and earnings growth will be a lower level of earnings in the future. For example, over ten years, $1.00 compounds to $1.34 at 3%, but to only $1.22 at 2%. The difference is about 9.3% less EPS for the stock market under the slower growth scenario. Many analysts would consider that level of variance a minor forecasting error for EPS over a decade. Whether the stock market is 9% higher or lower in a decade is generally small change in the context of overall returns. But the implication of slower growth is far more significant than simply the ending level of earnings – slower growth is a game-changer. 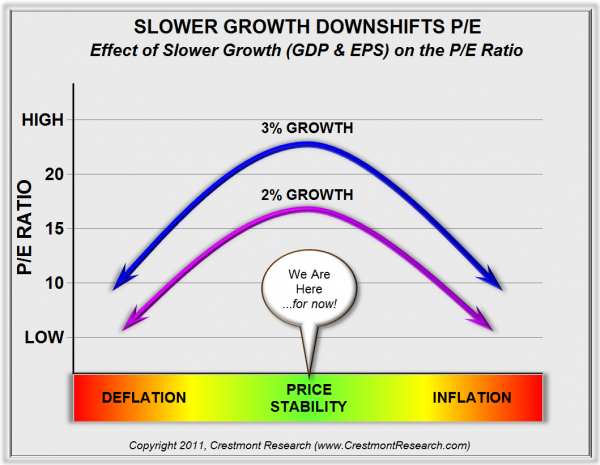 There are three ways to assess the effects of slower growth, all of which provide similar results. First, an extremely long-term model of earnings growth, dividend payouts, and present value can be constructed to assess the impact of changes in growth on P/E. Second, academic formulas can be employed to derive the effects on P/E based upon perpetual dividend growth. Third, the impact on P/E can be evaluated through the components of stock-market returns. Since all three approaches reflect comparable results, the more pragmatic third approach will be used here to explore the implications. As discussed above, inflation causes P/E to decrease because investors demand higher returns in compensation. Unlike the inflation rate, though, the growth rate of earnings does not necessarily change the return level that investors expect. They will still expect returns that are commensurate with the stock market and the expected inflation rate, but they will look to replace the contribution of slower earnings growth with another source of return. To illustrate, assuming that a change in the growth rate does not change the inflation rate, the yields on government bonds can be expected to remain the same. Absent a change in credit quality from slower growth, the risk premium for corporate bond yields will not change. Likewise, the expected return from stock-market investments can be expected to remain unchanged due to the growth rate. When slower growth reduces the contribution of earnings growth to total return, another source of return is therefore needed to make up the shortfall. Stock-market investors are not willing to take equity risk without appropriate equity returns. If bond yields do not change, they will not compromise stock-market returns. In this situation, stock-market investors will step away until the price of the market declines until it again provides adequate returns. This is the function of markets: finding the price that provides a fair return. This discussion relates to the effect from changes in the growth rate of earnings. To isolate that factor, several assumptions are needed, basically providing that the relevant relationships remain the same. First, based upon the previous economics discussion, a downshift in economic growth drives slower earnings growth. Second, long-term profit margins remain similar under both growth scenarios; thus the slowing of earnings growth is consistent with the downshift in economic growth. Third, the inflation rate remains constant across both scenarios for growth. Fourth, the expected return for stocks and bonds as well as the related equity risk premium for stocks does not change across both scenarios for growth. In other words, the relevant relationships remain constant. Of the three components of stock-market returns, two are available as sources of return, and the third one represents the way in which returns occur. The first source of return, EPS growth, is defined in this example as providing either 3% or 2% toward to the total return (“Historical Growth” and “Slower Growth” bars in Figure 2). As a result, the second source of return, dividend yield, will need to increase to compensate for lower earnings growth in the slower-growth scenario. Herein lies the role of the third source of stock-market returns: changes in P/E. The dividend yield rises as P/E declines, and vice versa. For the stock market to be positioned to provide equity-level returns, investors will look for the lower price that enables the dividend yield to rise sufficiently to offset the loss of earnings growth. The required decline in P/E varies based upon the starting level of P/E. If P/E starts relatively high, then a higher decline is required to provide the required dividend yield increase. For example, if EPS growth drops by 1%, then the change in P/E required to increase the dividend yield by 1% is 7 points (from 22 to 15), 4 points (from 15.5 to 11.5), and 2 points (from 10 to 8). This shift in P/E relates only to the change in earnings growth. P/E would then be further affected by changes in the inflation rate. Figure 3 provides another graphic illustration of the dynamics of the shift and growth cycles. The shift is related to changes in growth rate, and the cycle is driven by inflation-rate trends and levels. As previously mentioned, the two other methodologies provide similar results. A change in the forecast for future earnings due to slower growth results in lower present values. Likewise, the reduction in the growth-rate variable in traditional academic models also produces lower current values. Well, what about Bill Gross’ future of 1.5% growth, Chris Brightman’s outlook for 1% growth, and Jeremy Grantham’s ultimate rate of 0.4% growth? Two-percent growth downshifts the future average P/E from 15.5 to 11.5. If that is not concerning enough, note that a one-percent growth rate resets the long-term average P/E to near 9. At this point in time, there is a significant disconnect between the market’s expectation of future growth and the vision of these notable sages. P/E, normalized for the business cycle, is near 20. That is consistent with the current low inflation rate and historical average growth rates. Should it become apparent that either factor might change, beware the adverse impact of another P/E cycle, a new era with P/E shifting downward, or the compounded effects of both concurrently. There will likely be, and needs to be, much debate about the accuracy of the estimates presented above, and about nuances that could add decimal points to the factors or adjust the effects based upon further scenario assumptions. However, whether using long-term models, academic formulas, or the component-based method, all three approaches provide similar results. It is therefore important to recognize that slower growth will have a significant impact on P/E at all levels of the inflation rate. As the discussion evolves into implications and probable outcomes over this decade, slower economic and earnings growth will have a direct effect on the P/E range. We are frequently asked how we expect lower valuations to manifest themselves. The single-digit P/E ratios that are typical of the end of a secular bear market and the beginning of a secular bull market would mean either a significant drop in the current valuation of the stock market or a prolonged sideways market. A general awareness and acceptance of a slower-growth economy would certainly help bring about lower valuations. Investors are confronting the reality of the current secular bear market, which is both a consequence of the previous secular bull market and a precursor to the next secular bull. The duration of the current secular bear period is uncertain. Should higher inflation or deflation overcome the currently rather stable inflation regime in the near term, this secular bear could end sooner, as that would drive valuations down. That outcome, however, would cause significant losses to stock market portfolios. If, however, inflation or deflation slowly creeps into the economy – over the next decade, for example – then this secular bear will be one of the longer ones. However, if this decade repeats the relatively low inflation of the past decade, then the secular bear may linger longer than any of us would like. Beyond the inflation rate, economic growth will also have an impact on the future of this secular bear. Following last decade’s below-average economic growth, if we are to return to the 3% historic growth trend, then this decade must soon start to generate above-average growth to offset the recent shortfall. The result would be a solid boost to earnings in this decade. However, economic growth could also have downshifted during the last decade to a lower level that will persist for the foreseeable future. The result would be a significantly lower range of P/Es, but not necessarily a progression through and out of the secular bear market. 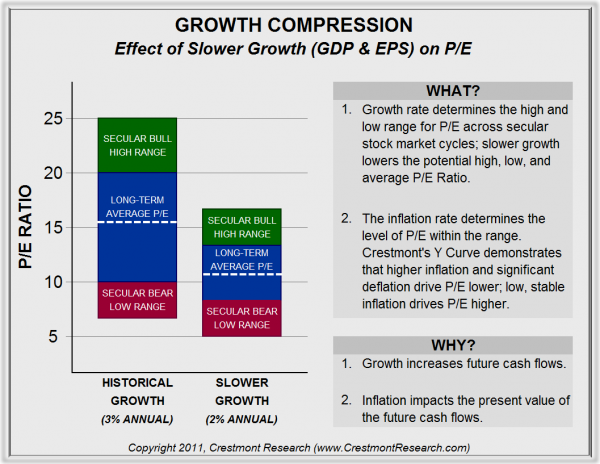 The economic growth rate can shift P/E upward or downward, but only inflation or deflation can kill a secular bear. Whether this secular bear cycle ends in five years, ten years, or beyond, the ultimate outcome will be the start of the next secular bull market, which will bring an extended period of above-average returns. Spring will finally have sprung. There is a rainbow out there somewhere. 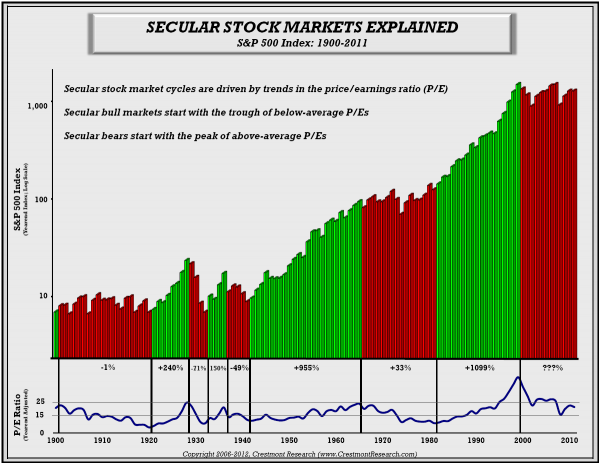 This longer-term view of secular stock market cycles lets us look out across this secular bear to the next secular bull. The operative word is “across” this secular bear and not past it. “Across” recognizes the reality of the risks and opportunities presented by the secular bear in whose grip we find ourselves. “Past” suggests the ostrich-like approach of ignoring reality in the blind hope of an unrealistic outcome. “Across” is enabling, while “past” is disabling. For investors who are accumulating for the future, secular bear markets are times to build savings for later investment. This is done not only through contributions but also through prudent investing by means of an absolute-return approach. The absolute-return approach uses the dual strategy of risk management and investment selection. Investment portfolios should be diversified across a range of investments that are diligently selected and actively managed, especially ones that control risk and enhance return. Investors should not avoid the stock market nor bond market altogether. Instead, their objective should be to seek, in both markets, investments that incorporate elements of skill to enhance returns. Secular bear markets are not periods during which to avoid investing; they are periods that demand an adjustment to investment strategy as well as to expectations regarding what potential returns can be. For investors in pension funds and retirees who are more dependent on their current assets, early recognition is key to the investment strategy. The principles of absolute-return investing are important for preserving capital and generating much-needed returns; but it is potentially even more important for these investors to manage their assumptions and expectations. Recognizing secular-bear market conditions earlier enables investors to make potentially painful adjustments more easily and with less damage. Delaying action until crisis has onset generally brings adverse consequences! Hoping that the next secular bull market will arrive quickly is not a prudent way to address shortfalls. The longer it takes you to adjust expectations, the greater the gap you will have to fill and the shorter the time you will have to fill it. This strategy applies most of all to those entrusted with the management of pensions, both private and public. The largest fraction of the monies a pension fund will pay out in the future is expected to come from investment growth. At the beginning of the last decade, pension funds were routinely expecting to get 8% or higher returns on their investment portfolios. Those projections have proved a dismal illusion. Yet pension funds continue to anticipate 7-8% returns going forward. The very people who should know best that past performance is not indicative of future results are expecting the stock market to return to past performance to give them their longed-for results. These pension-fund shortfalls will mean higher required contributions from corporations. More important, and urgently, they also mean higher required funding for public pensions from taxpayers, accompanied by a reduction of promised benefits. We do not see how the state of Illinois, for example, can meet its obligations without a significant restructuring of its pension plans or its budget, or more likely both. While those receiving pensions would prefer higher taxes on those funding them, there is a limit to what taxpayers will bear. Sadly, we’re going to find that this is not just an Illinois problem, but one that will become apparent in states, cities, and counties all across the country. This is going to cause a great deal of distress for everyone concerned. Finally, a comment on GDP growth. The downbeat forecasts mentioned at the beginning of the letter are all based on different methodologies, and we will venture one further argument. It is highly likely that taxes are going to increase over the next few years, and not just due to the current “fiscal cliff” issue. No matter which path is chosen in the short term, it seems improbable that a true resolution to the total deficit issue will be accomplished. More deficit-reduction work will be needed. That means spending cuts, accompanied by yet more tax increases. However you view the prospect of increased taxes, there is no way to get around the fact that they will reduce general savings. If you reduce savings you reduce the capital available for investment in current and future businesses. If you reduce capital formation, you’re going to reduce future growth. The current fetish among the economic thought leaders is that consumption is the driver of GDP growth. But GDP growth is ultimately a reflection of increases in population and productivity. And if you want to increase productivity, you must increase capital available for investment. The most important determinant of our productivity per person is the amount of capital we have available for investment, and wise use of that capital. Investing to improve productivity in all of its forms, from machine tools, to transportation infrastructure, to education, can all raise our productivity. Investing requires savings, and we have been saving far too little. To increase productivity requires that we reorient our economy away from debt-financed consumption and toward saving-financed investment. The politicians in Washington all give lip service to the need for growth. But then they turn around and do the very things that make it more difficult for the economy to grow. And as we have seen, this is going to make it more difficult for the stock market to return to a secular bull path. Which will create a greater need for higher taxes and/or reduced spending on the state and local levels. Which of course hurts GDP growth. We are coming to the Endgame. There are no easy solutions, only very difficult ones. And none of them bode well for future equity valuations. John here: I can tell you that there is deep concern when Ed and I talk about the consequences of government actions and potentially slow GDP growth for the average investor. All too few people understand the links between government decisions and their retirement portfolios. If you are reading this letter, you are one of those few. You do have options, but there are no easy options any more. For those interested in cycles I suggest you take a close look at Ed’s books, Unexpected Returns and Probable Outcomes, and his excellent website, www.Crestmontresearch.com. It is a treasure trove of knowledge. At the beginning of each year, Ed updates most of the website’s charts and graphs, many of which were included in one or both of his books. I also recently wrote a paper along these lines, published by my partners at Altegris, on its home page. My paper focuses on managed futures, and you’ll find other papers on alternative investments, along with a lot of worthwhile research Altegris has done. “Alternative investing” is increasingly a part of accepted investing methodology. In my opinion, alternatives should be defined broadly to mean not sitting back and depending on “buy and hope” (otherwise known as buy and hold) equity indexes. We will have reason to explore this topic further in the coming year! You will likely be getting this letter on New Year’s Eve. Let me wish you a very happy and prosperous new year. Have a great week. Thanks for spending yet another year with me. And I look forward to 2013 being the best and most interesting one ever. Note: Ed Easterling is the author of the recently released Probable Outcomes: Secular Stock Market Insights and the award-winning Unexpected Returns: Understanding Secular Stock Market Cycles. He is president of an investment management and research firm and a senior fellow with the Alternative Investment Center at SMU’s Cox School of Business, where he previously served on the adjunct faculty and taught the course on alternative investments and hedge funds for MBA students. Ed publishes provocative research and graphical analyses on the financial markets at www.CrestmontResearch.com.